Spanning across a variety of cultures and countries all around the world, there’s (at least) one thing that people just seem to be dazzled by: lights! From the world’s largest floating Christmas tree on the water in Rio de Janeiro to the Vivid Festival in Sydney, perhaps there’s a fundamental human fascination with the idea of colorful lights. Maybe it’s because all humans share the same physical senses and visual capacity and that we can all appreciate a tasteful aesthetic here and there. Whatever the science is behind people’s fascination by light, we here at New Edison Lights are also rather captivated by lights. It’s in our name, after all! Proudly serving the front range of Colorado, we’ve helped countless businesses with their LED parking lot lighting, lighting audit and overall eco friendly lighting needs. Time and time again, these companies have seen significant cost decreases in lighting costs after undergoing energy efficient lighting upgrades from us. Curious about saving money for your business and switching to the modern, sensible alternative to conventional lighting? New Edison Lights would love to help! Schedule a lighting audit today to learn more about energy efficient lighting upgrades. Below, we’re going to cover some of the world’s most fascinating and dazzling international light shows. If you’ve never witnessed several thousands of candle-lit paper lanterns floating across the night sky in a serene-type of fashion, you should. What started as an old tradition in Taipei to let people know from surrounding areas that the town was safe has evolved into an annual event in Taiwan celebrating peace and prosperity. To personalize the experience, festival-goers write their own message in each paper lantern, hoping that it will reach the right person. Seeing unique visual art being (harmlessly) projected onto historic city structures is truly a sight to behold. By combining rich European history and the modernity of projection mapping, the Festival of Lights in Berlin is regarded as one of Europe’s all-around best light festivals, and for good reason. Indeed, you’ll see vivid, bright patterns displayed on key landmarks like the Siegessäule, Reichstag, Berliner Dom and even the Tempelhof Airport. Walking around the light festival, you might notice monks dawned in neon-lighted costumes – these are actually artists who go around interacting with enchanted light viewers. As one of Sydney’s premier winter events, this energetic festival features musical performances, talks, and over 90 different installations and light projections all throughout the city. If you want to beat the summer heat and soak up some true Aussie culture, enjoy the fact that iconic landmarks like the Sydney Opera House and Sydney Harbour Bridge are brilliantly projected with stunning, colorful lights. We know that we would enjoy it! 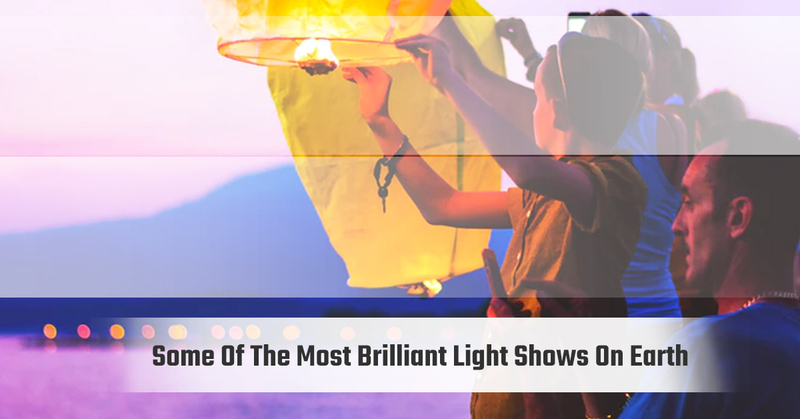 LED lights for parking lots might not be as culturally-riveting as witnessing thousands of paper lanterns graceful floating through the sky, but New Edison Lights shares the same passion for lighting as these lighting festivals. We hope you enjoyed the read, and if you have any questions about commercial parking lot lighting fixtures, energy efficient lighting upgrades or you’d like to schedule a lighting audit to see how much money you can save with LEDs, get in touch with New Edison Lights today!